Finca La Carpio is a 9 mile square piece of land owned originally by the Costa Rican medical system to be used as a recreational area for their members. Over thirty years ago, Nicaraguan immigrants came to the land and placed plastic and corrugated tin shacks on it. Our Foundation began volunteering in La Carpio in 1997 with the urging of one of our volunteers. She saw the need for increased education and health care for the children of the community so we organized a series of workshops for women and children at the school. Through the years, we provided a wide variety of services to the children from clothing distribution to toys for Christmas to toothbrush distribution to health workshops. 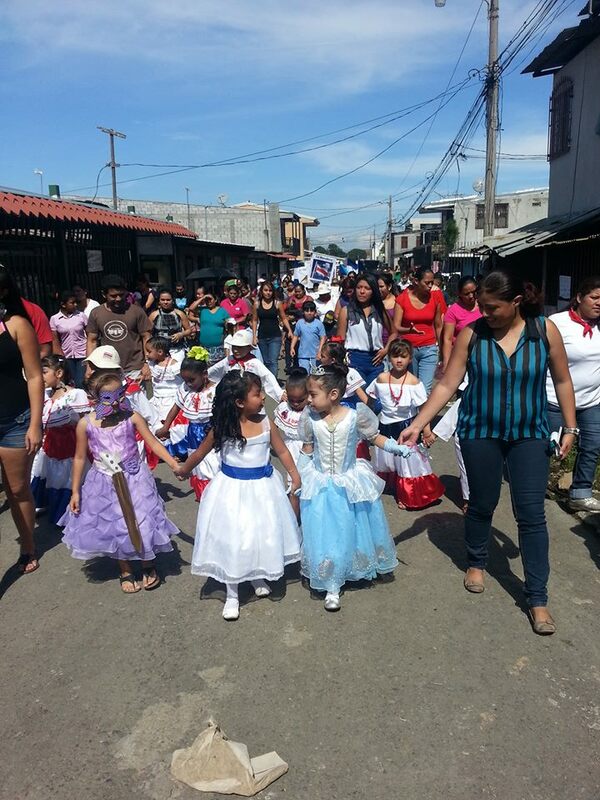 Dia de La Independencia/ Independence Day in Costa Rica being celebrated in La Carpio. The band uses instruments donated to the Foundation and passed on to the right hands 5 years prior. Since that time, there have been an increasing number of squatters on the land and now, there are about 34,000 people living there. The Nicaraguans have arrived through the years for a variety of reasons including, the devastation of a civil war, the destruction of natural disasters and the desperation of poverty that led to hunger. The people who came here are resilient, strong and resourceful. Because of the fact that Costa Rica is the signatory to national treaties guaranteeing the right to education, healthcare and livable housing to all those who live in the country, these immigrants were able to receive free public education, a chance for adequate health care, infrastructure improvements in their communities and opportunities to search for work. The housing situation has improved for most of the families living in this area due to their own hard work and frugality. Soon, the government will be assisting them in the process of legalizing the title to their land. Several individual volunteers have created video projects documenting volunteer experiences and work the Foundation does in communities as a part of their experience in Costa Rica. Copyright (c) 2017 CRHF. All rights reserved.